A year after the influential center for sustainable agriculture research was defunded, farmers and students are urging Iowa’s legislators to reinstate its budget. Nearly a year ago, the Leopold Center for Sustainable Agriculture, one of the country’s preeminent research centers for sustainable agriculture, was defunded via budget cuts made by Iowa’s state government. Now, a grassroots coalition is fighting to revive the Center and to educate the public on why its work matters more than ever. Last Tuesday, students, farmers, and community members called for a “fully funded, fully staffed, re-imagined” Leopold Center during a press conference at the Iowa State Capitol building and in meetings with legislators and staff members at the governor’s office. 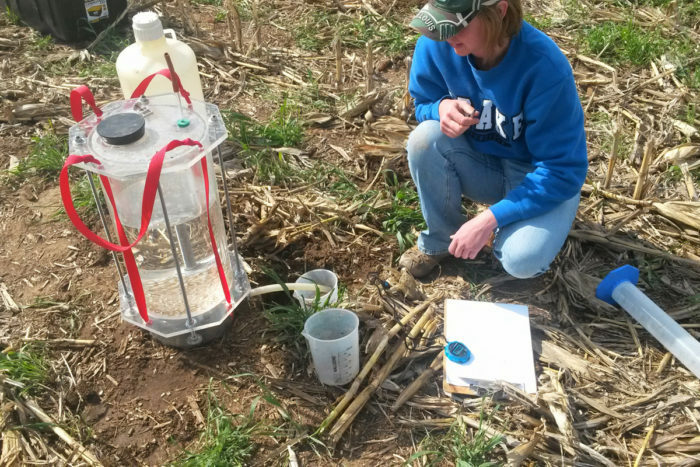 “The work is far from done,” said Liz Garst, a conventional row crop farmer who’s been involved in Leopold Center research on several topics, including prairie hay and cover crops. Because these practices are uncommon in a state where most farmers grow only corn and soybeans in otherwise bare soil, and most university-level research in the area focuses on that system, losing any hub for alternative information is significant. “As a practicing cover crop farmer, I have way more questions than answers,” added Garst. The Iowa Sustainable Ag group—which also launched a website that includes a petition and videos highlighting the center’s work—included representatives from the Iowa Farmers Union, the Women, Food, and Ag Network, the Center for Rural Affairs, and several former students from Iowa State University’s (ISU) Sustainable Agriculture Graduate Program. “A lot of the students received funding and support from the Leopold Center, and some of them came to ISU to study because the Center was there and it has an international reputation,” said Debbie Bunka, a representative from the Iowa Farmers Union. The participants in last week’s event signify the Leopold Center’s wide reach. Iowa Farmers Union president Aaron Lehman, who farms both organic and conventional row crops, spoke alongside several other farmers who talked about how the Center had supported their work in the fields. Third-generation organic crop and livestock farmers Ellen Walsh Rosmann and Daniel Rosmann spoke about how the Center supported their creation of a food hub that now links over 40 producers in western Iowa to institutions like schools and grocery stores. Daniel Rosmann said the hub was one tool for supporting Iowa’s struggling rural communities, a topic the Leopold Center had advanced in many ways. “They have created an understanding of what rural communities need to survive and thrive,” he said. 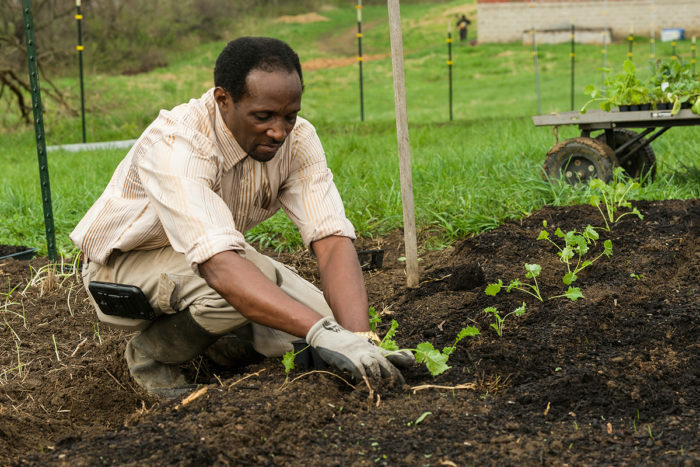 Between 1987 and 2017, the Center awarded more than 500 research grants to study pressing agriculture issues like conservation buffers, rotational grazing, and building local food economies. While Leopold’s focus was on Iowa’s specific food and farm landscape, many of its findings have had national and international impact. In fact, the day before the press conference, the results of a new Leopold Center study made the news, promising “transformative” change for the dairy industry. The study, published in the Journal of Agricultural and Food Chemistry, identified a new technique for differentiating between milk from grass-fed cows and that from cows fed grain. Fluorescence spectroscopy, the researchers found, measures the amount of chlorophyll metabolites in the milk and found that they were higher in milk from the cows fed grass—a fact that could make it easier for the industry to monitor whether producers using the “grass-fed” claim are truly grazing their cows on pasture. Last week’s advocacy event marked a bright moment during a tough year for Rasmussen, who, since the funding disappeared last May, has been presiding over shutting down most of the Center’s operations. The staff’s first order of business was figuring out how to manage the grants that had already been awarded. They moved up the end dates of some projects so that they could be completed before the end of last year, and transferred 20 projects to the Iowa Nutrient Research Center for completion. Twelve projects were cancelled outright, although four of those found alternative funding. After dealing with the grants, five of the Center’s staff members were let go, leaving just two: Rasmussen and distinguished fellow Fred Kirschenmann. The duo moved into a smaller office and downsized 30 years of records, taking care to maintain the history and work of the center. They received a commitment from ISU, for example, to keep the Leopold Center’s website up and running, with all past research searchable in the university database. Finally, they set up listening sessions around the state to hear input on what the future of the Center could be, with the goal of determining a narrower focus with limited resources. “The old Center is gone; we have to accept that and think of a new Center, a Leopold Center 2.0,” Rasmussen said. “When Leopold Center started it was the only game in town. Thirty years later, there are a bunch of organizations that are focusing on beginning farmers, women in agriculture, you name it.” Using information from the listening sessions, an 11-member volunteer task force conducted a gap analysis to look at where the center should go from here. Findings from the analysis will be presented to the Center’s advisory board in March. If the grassroots advocacy campaign is successful, however, Leopold 2.0 won’t be a stripped-down version of its former self. At the Capitol, the activists—several of whom worked on fighting the Dakota Access pipeline—talked to lawmakers about supporting new legislation that was introduced by state representatives Charles Isenhart and Beth Wessel-Kroeschell. The bill would make $1 million in annual public funding available to the center if ISU’s president first raised the same amount in private funds. Together, the $2 million would equal the Leopold Center’s pre-cutback budget. “This legislation would provide the opportunity for [ISU] President [Wendy] Wintersteen to demonstrate her commitment to the Leopold Center and deploy her fundraising skills to benefit the Leopold Center, advancing the cause of sustainable agriculture in Iowa,” Rep. Isenhart explained by email. David Osterberg, the co-founder of the non-partisan Iowa Policy Project and one of the former state senators who created the Leopold Center, blames the influence of agribusiness on legislators’ unwillingness to support the center. Bunka confirmed that in meetings, legislators said they perceived the Center as “bashing conventional ag,” which is one reason part of the advocacy group’s mission is educating the public education to help more people understand the Center’s mission and activities. 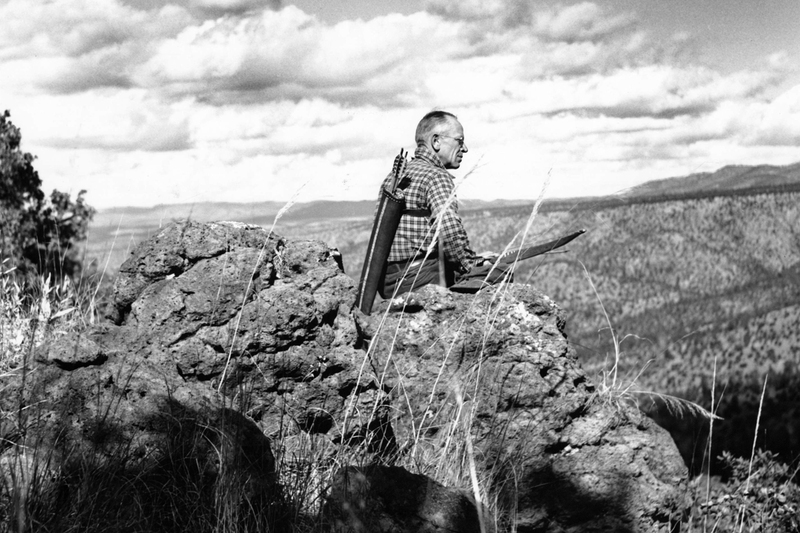 Top photo: Aldo Leopold during his 1936-37 trip to the Sierra Madre in Mexico. Photo by the U.S. Forest Service.